Maria V. Snyder's trilogy, or at least the start of it. The librarian who told me about it said she took the first volume home, and was tempted to break into the library over the weekend to get hold of volume 2. All about ... writing and work. Good comments, too. 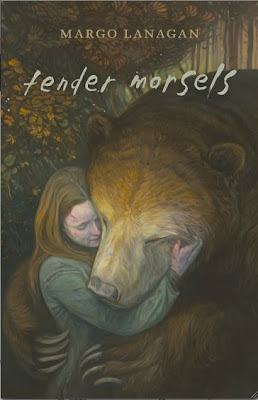 I've just seen the draft cover of the Vintage paperback edition of Tender Morsels. It's basically the same design as the Cape hardback (silhouetted bear flanked by girls, crows scattered about, etc.) but in a different colour scheme. Below the title are splashed the words 'A WORK OF GENIUS'—Sunday Telegraph. 'Sea-Hearts', Margo Lanagan, X6—a dark and twisty take on the legend of the selkie wife. In this novella Lanagan builds up a fogged, muddy and claustrophobic world of seal-women, their husbands and their sons, all part of a tightly closed island community. Through her usual tangled prose and deeply hidden emotion, Lanagan presents a simply glorious fantasy that transcends rather than merely replicating the story's mythic roots. Those who loved Tender Morsels will be drawn to this story, which is less difficult to stomach but contains many similar themes. which, with a 3 day week, doesn't have nearly the effect on the spirits that a Monday of a 5 day week does. Quite a weekend. We well and truly launched Deb's A Book of Endings (Cat Sparks enpictured it) on Saturday afternoon, then celebrated all evening. Then, on Sunday, hardly hungover at all, I went off to the NSW Writer's Centre and leapt in the dark with my 16 workshoppees, who were very diligent. There is nothing quite like the rustling silence of 16 people scrapbooking towards their stories. I managed to keep them occupied for the full six hours (well, I let them have some lunch), and it went quickly for me and for at least some of them, so I think we all got into it. And, apart from one school gig at the end of October, that's pretty much it for the public-writering for the year - no big things until Wellington next March. So I can relax a bit. Possibly, you know...write something. Odd thought. At NSW Writers' Centre? You know you want to. 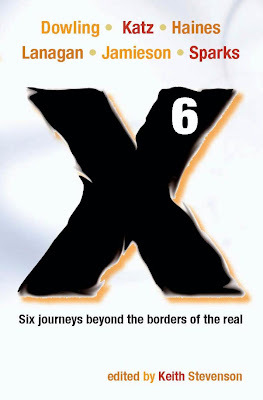 Keith Stevenson's novellanthology X6 is on its way—I got my copy last week. My selkie novella 'Sea-Hearts' takes up the first 83 pages, which I find darned impressive, but the size of the whole collection is satisfactorily bricklike, considering there are only 6 stories in it. X6 will be launched in November at Berkelouw's in Norton Street, Leichhardt. Cate Kennedy's short story collection Dark Roots. Since then I've been trying to re-absorb the collected works of J. D. Salinger, who was my area of expertise for the Literary Smackdown. In the end, those questions didn't happen, but it's been good rereading them anyway. I've done my stint for the NYWF and I'm back home. Performed Creative Health Checks for 2 hours on Friday afternoon. This involved grilling 5–6 people about their creative practice and offering advice on what they could do to make things better for themselves. It was surprisingly fun—the most surprising thing was that people just turned up, were shown in by my diligent nurse Chris and sat down in the other comfy chair and talked, to a complete stranger, about their lives and hopes. None of them probably needed me to do more than nudge them in directions they were already on the point of already taking, but the nudging felt useful. Sat on a panel with Christine Hinwood, James Phelan and Phillip Gwynne, chaired by Bethany Jones, about books we read when we were young, and how they affected our writing, and about literary influences, and YA literature and people's expectations of it, and all sorts of stuff. It struck me how much more got said when the sessions were an hour and a half long, instead of the usual festival 45 minutes to an hour. Although, I know, if a session was falling flat, an hour and a half could feel pretty long. But this one worked! 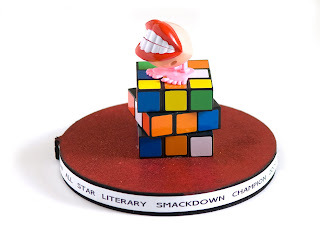 Took part in the event I've been terrified about since I agreed to do it several months ago, the All-Star Literary Smackdown! Tom Doig, an excellent pratfaller and profanity-sprayer of an MC, MC'd us. Technical difficulties meant that the teams couldn't heckle each other as effectively as we would have liked (so we were occasionally limited to rude gestures), but there was some excellent heckling from the crowd, and, of course, after the terror, the best team won, which was Phillip, Marieke Hardy and me, up against Anna Krien, Michaela McGuire and Guy Blackman. Picture of trophy to come; it is very colourful. Everything I saw of this festival seemed very well attended with really attentive audiences/participants. I'd recommend exploring all its possibilities, anyone who's in the area in future years. It's got quite a different energy from your average litfest. Just take an umbrella and waterproof shoes. Ate and drank very well at, among other places, The Last Drop cafe, and Zinc in Darby Street. Got quite cold and wet, which was a bit of a shock to the system after we'd cooked on Thursday. Saw the Margaret Olley exhibition at the Newcastle Regional Art Gallery. Walked around the headland opposite Nobby's, admiring hang gliders, pelicans, very brave surfers and swimmers and even one crazy jetskier managing to stay upright in the chop. Some good dogs around, too. I'm back at work, at quite a nice gig, i.e. not in a financial services institution. I'm working at a university, helping document Blackboard for the teachers there. It's 3 days a week, and I'll try to manage without filling up the other 2 days with anything but writing for as long as possible. It goes until the end of the year, and possibly longer.